Palawan – the best island in the world – has become popular among travelers thanks to its scenic islands beauty and its natural wonders. Aside from the beautiful pictures that you could post and share on the social networks, there are also other things in Palawan that you may be able to “share” and “show off” to your friends when you come home from your trip to Palawan. Just like any destination in South East Asia, Palawan also offers a variety of quality and unique handicraft and souvenirs. A trip to Palawan cannot end without souvenirs and whenever you travel, you have to make sure that you get at least one souvenir from the place you have been to. Souvenir sellers are present in almost every part of Puerto Princesa. We’ve prepared a list to help you find out which are the must-buy souvenirs from Palawan. The handicrafts are usually made by the indigenous tribes of Palawan who sell their work in the city to acquire the money that they need for subsistence. These handicrafts are usually made of wood that they harvest from their environment – mostly the forest and in the mountains – these handicrafts depict their art and culture which adds up to the cultural and heritage value of the indigenous peoples of Palawan. According to records, most of the handicrafts that are sold as souvenirs are made by the Batak Tribe. 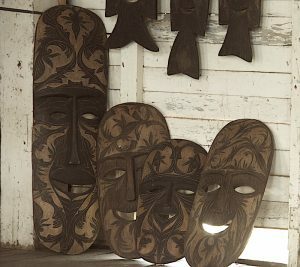 In Puerto Princesa, along the Rizal Avenue there are shops that sell authentic Batak handicraft including wooden masks and sculpture. Most tourists and sellers dubbed it as “Wild Pig Figurine” due to its shape – a wild pig. It is a functional hardwood item that would be very useful for those who smoke. This figurine is a pipe for smoking – one has to inhale from the wild pig figurine’s snout. For those who do not smoke, this figurine may be used as a display in your abode. Biday is a handicraft that may be used in many different ways, some use it as blinds for their windows, or a wall decoration while others prefer utilizing it by making it a divider or a floor mat. Biday is made from rattan, a wood product. Although it is not a handicraft that originated from Palawan, the rainmaker have become a hit to many people who get curious as to how one can put something inside a bamboo without breaking it. The Rainmaker is a cylinder-shaped handicraft that makes a sound similar to the rain pouring on a tin roof when it is being moved or when someone shakes it. It comes in various sizes that may fit one’s preference. It also has artworks around it which are done by carefully designing the wood through the use of burning. One of the more popular souvenirs from Palawan are pearls. These pearls cultivated along the island come from different colors and sizes and may be brought in the souvenirs shops and jewelry shops in the malls. The peals sold in the markets and souvenir shops won’t have the same value as the ones in more reputable jewelry shops such as South Sea Pearl Museum in SM Mall. Palawan also offers a wide variety of local food that may serve as a souvenir. Many of these are considered as the pride of their respective municipalities where they have originated from. The best time to buy local food is during the “Fiesta”. Celebrations in Palawan known as “fiestas”, typically includes street parades, fireworks, dance competitions, beauty pageants contests and Food Fairs. 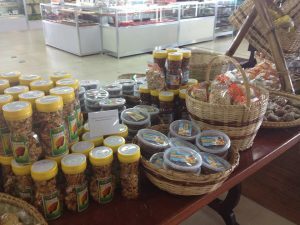 Some of the best locally made products can be found at the food fairs organized at the Provincial Capitol in Puerto Princesa city. Each municipality displays its food specialties throughout the fair – so make sure to bring home some of Palawan’s delicious treats to share with your friends and families. Honey is another delicacy here in Palawan. While most sell processed honey, there are souvenir shops that still sell wild and raw honey that has nothing added to it. The indigenous people of Palawan usually harvest the wild honey and sell it to the shops in the city proper to acquire money that they need for their needs. Buti-buti is a delicacy from the municipality of Cuyo. This sweet ampao “poprice” of Cuyo hasn’t got yet too much attention from tourists since it can be found only in Puerto Princesa during the annual Baragatan Festival. Buti-buti is made with dehulled but unpolished native rice with bran that is usually red or brown in color. These grains are pan-roasted until they pop and look like popcorn. Caramelized muscovado sugar is added to the grains to sweeten and bind the caramel – coated poprice that is later molded (by hands) into small balls that are about the size of a golf ball. The rice used for buti-buti is an heirloom rice of Cuyo, Palawan. It is seasonal and available depending on when there is harvest or if it is in-stock. The province of Palawan is also famous for its Daing which may be bought from the wet market in whichever municipality in Palawan you are. Daingare fishes that are cleaned, salted, and then dried under the sun for days before it is sold in the market. Daing is a perfect match to any dish, even with just plain rice and maybe some condiments like soy sauce or vinegar. The waters of Palawan are incredibly rich with fish, especially tune. The tuna fillets packaged in glass jars are one of the best food products from the municipality of San Vicente. If you like bananas, you just might like banana chips. The dried and deep-fried banana chips, is the popular snack enjoyed all across Palawan. Mangoes are also available in the form of dried fruit chips. It’s a powdered drink made from ginger and turmeric, which are plants native to Southeast Asia. Drinking turmeric and ginger tea is believed to bring several health benefits. Polvoron is a Filipino-style shortbread made with toasted rice flour, powdered milk, sugar, and butter. It tastes divine as it crumbles and melts in the mouth. Coconut jam is a popular jam in the Philippines made out of coconut milk and brown sugar. Rich, smooth, and with a caramel flavor, it’s the perfect spread for breads and topping desserts.